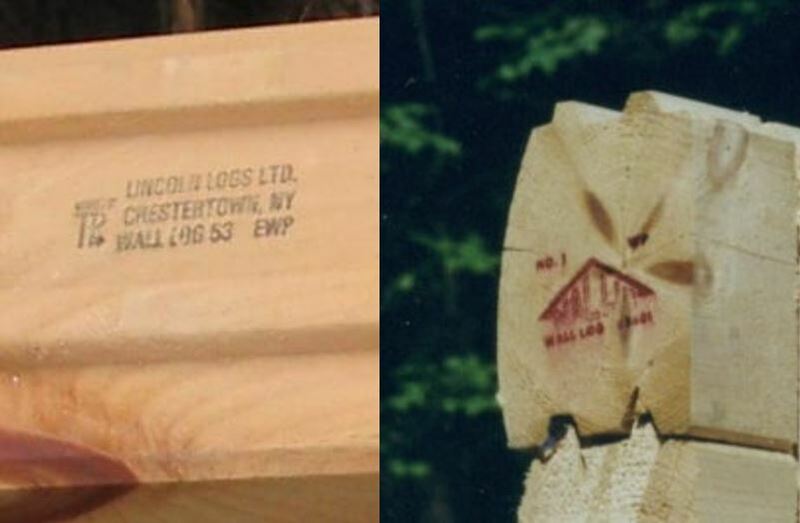 The Log Homes Council retained Steven Winter Associates in the late 1970’s to establish a standard for the visual stress grading of non-rectangular timbers used in log construction. The result was ASTM D3957. With that the standard and accreditation by the National Evaluation Service in place, training and implementation fell into Rob’s hands. He has been in log grading ever since. Log & Timber Homes Council Member Companies are required to participate in an accredited log grading program. They demonstrate their participation by providing a Certificate of Inspection and/or marking the logs. Examples of grade marks on logs are shown below. 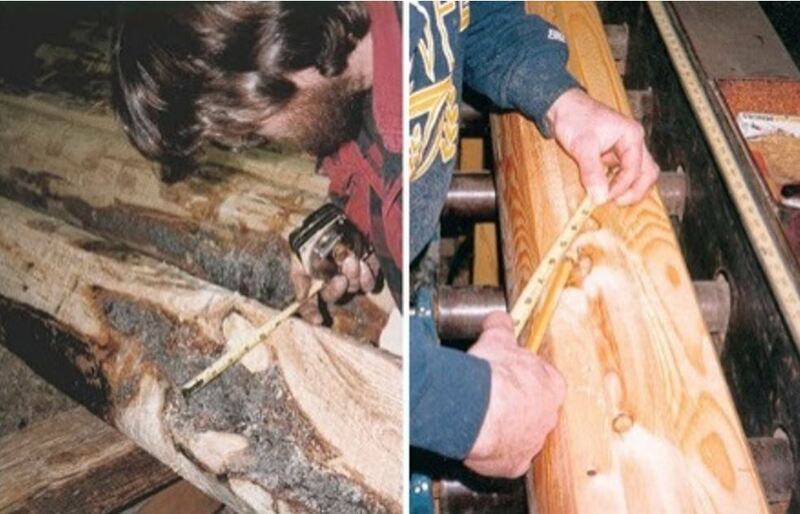 Below, Certified Graders measure the knot size on a Sawn Round Timber Beam (left) and Wall-Log (right) to determine the visual stress grade. 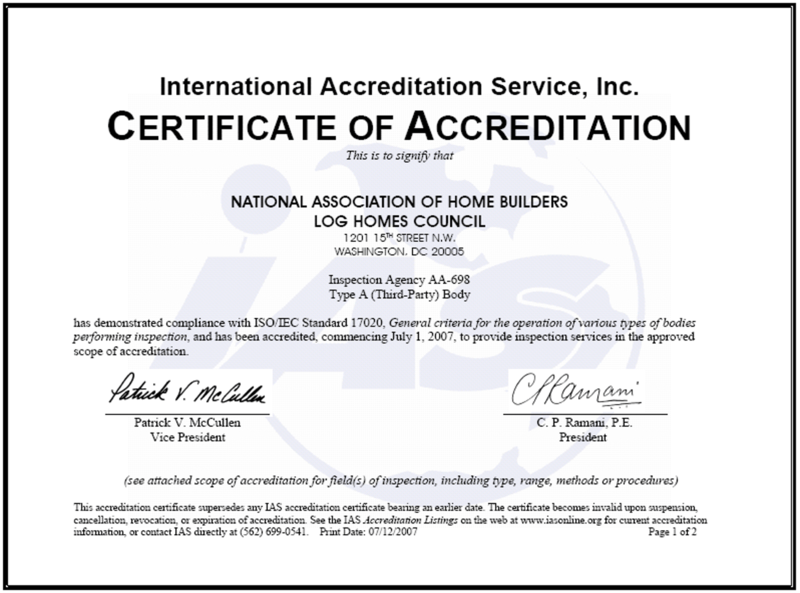 Today, the Log Homes Council of the National Association of Home Builders is accredited through the International Accreditation Service, Inc. as a rules-writing log grading agency. Ed Burke maintains the accreditation. Visit the literature page of www.loghomes.org for more information about log grading. Program Administration — Ed Burke has performed this function since 1986. Training & Certification of Participants — Initial training was contracted to Steven Winter Associates, Inc. with training sessions held in 1984 in Albany, NY, Missoula, MT, and Knoxville, TN. [Rob] Ed Burke has performed the on-going training since 1986, adding principles of wood science to the training. Log Homes Council Grading Program Training & Operations Manual; Log Homes Council of the National Association of Home Builders contracted with Steven Winter Associates, Inc. to create a grading program. This document was developed by Rob while part of Steven Winter Associates and was first published in 1984. Ed Burke has worked with IAS to update it several times as Program Administrator.